On enlistment Arthur was posted to 8th Light Horse, 17th Reinforcements and marched into 3rd Training Regiment, Tel el Kebir, 11 June 1916. He subsequently joined the Imperial Camel Corps, 1 July 1916, and taken on strength of No 11 Company, Imperial Camel Corps, the same day. Four months later he transferred to the 3rd Anzac Battalion, Imperial Camel Brigade. Arthur was evacuated to hospital, El Arish, 29 December 1916 (pleurisy); on discharge in February he re- joined his unit in El Arish. A few weeks later he was back in hospital with pleurisy until June when he was discharged and joined the Imperial Camel Corps Brigade in Abbassia the same day. He proceeded to his unit, 4 July 1917 re-joining the 3rd Anzac Battalion, Imperial Camel Corps, El Shabith on 5 July 1917. Due to reorganisation of units he transferred to the 15th Light Horse in July 1918. He was back in hospital in October with pneumonia dangerously ill. Arthur died two weeks later on 14th October, 1918. He was buried by Chaplain A.P. Durant, 17 October 1918. February 1917 marching into the Pioneer Training Battalion at Sutton Mandeville. He sailed for France in May 1917 returning to England for medical attention in October after a gunshot wound to his buttocks. On 30th May 1918 he proceeded back overseas to France re-joining the 2nd Pioneer Battalion. After illness at the beginning of 1919 he went to England on leave. After returning to France from leave in March he was assigned to the Graves Registration Detachment. He joined the 2nd Pioneer Battalion as they returned to England for transport back to Melbourne per “Port Denison” in November 1919. Sydney returned to farm at Winchelsea up to his death in 1944. He married Alice Jefferis in 1923 and they had four children. Edward returned to farming at Wurdi Boluc after his war service. He married Eva McHarry in 1922 they had three children. In the late 1940’s they moved to Tabilk just outside of Nagambi where Edward continued farming. By 1954 they had moved into Nagambi with Edward share farming and son James as farm hand. Edward died at Bright in 1954. 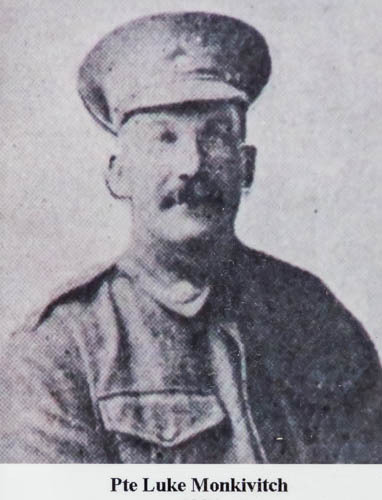 Henry, auctioneer, married man and father from Newtown enlisted in the AIF on 23 November 1916. He was appointed to the 6th Battalion, 24 Reinforcements at Royal Park training grounds. After eight weeks training he embarked from Melbourne per HMAT Ballarat, disembarking at Devonport on 25 April 1917. 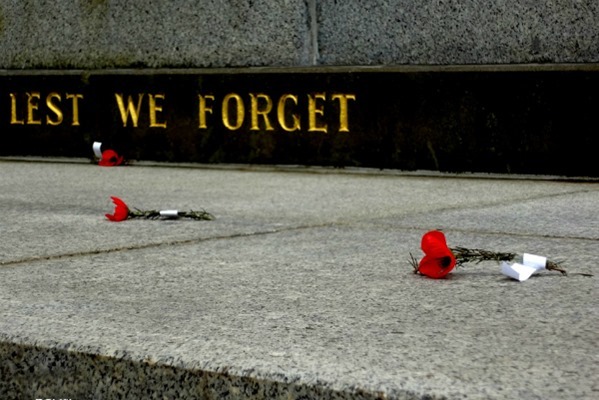 It was a different type of disembarking……….. the troop transport HMAT BALLLARAT was approaching Southern England, off The Lizard, when she was torpedoed by a U-boat just after 2pm on April 25, the second Anzac Day. The 1600 men of the 24th Reinforcements Regiment had lunched, and officers were planning an Anzac Day service later in the day. On this occasion, all 1720 souls aboard BALLARAT survived. The New York Times report on her sinking said the men sang songs and played cards as the ship was sinking. Songs mentioned were ‘Australia Will Be There,’ ‘The Long Trail’ and ‘So Long Lettie.’ The bandmaster was playing doleful notes on his cornet, and down in the saloon a Sydney soldier named Michael Keene was playing rag-time on a piano, so rapt that someone had to be sent to get him as the last lifeboat left. Once on land Henry marched into the 2nd Training Battalion at Durrington. He stayed in England for eleven months before proceeding overseas to France on 6 March 1918 attached to the 6th Battalion. In March and April 1918 the battalion helped stop the German spring offensive and later participated in the Allies’ own offensive, launched near Amiens on 8 August 1918. The advance by British and empire troops was the greatest success in a single day on the Western Front, one that German General Erich Ludendorff described as “the black day of the German Army in this war”. Henry was poisoned with gas on 4 October 1918 and invalided back to England and once recovered he returned to Australia per ‘Orsova’. While overseas Grace and their daughter had a change of address and were now living in Toorak. On return Henry joined her continuing his occupation as an auctioneer. By 1924 they had moved to Bambra where Henry was a farmer until his death on 10 November 1947 at Heidelberg. Albert and Margaret were living at Lake Boga when he enlisted in the AIF. He did his basic training at Seymour Army Camp before embarking from Melbourne on board HMAT Runic on 20 June 1916 and arriving in Plymouth on the 10th August. He spent some time training in England before being sent to France on the 23rd of November. Five months later he was admitted to hospital with ulcerated lip. Shortly after, on 4 May 1917, Albert was transferred to Cardiff, Wales for treatment on the lip. He returned to his unit in France in August just prior to the Third Battle of Ypres. He was involved in a number of other significant battles in France and during this time promoted to temporary Lance Corporal. Albert arrived home on 6 June 1919 and back to Lake Boga to live until 1922. The family then moved to the farm at Bambra. Albert and Margaret had five children. Albert died in 1941. On enlistment Roy was given the rank of Driver in the 12th Reinforcement of the 2nd Field Company Engineers. Engineers, also known as sappers, were essential to the running of the war. Without them, other branches of the Allied Forces would have found it difficult to cross the muddy and shell-ravaged ground of the Western Front. Their responsibilities included constructing the lines of defence, temporary bridges, tunnels and trenches, observation posts, roads, railways, communication lines, buildings of all kinds, showers and bathing facilities, and other material and mechanical solutions to the problems associated with fighting in all theatres. They embarked from Sydney on board the RMS Mooltan on 11 December 1915 and disembarked at Suez a month later. Roy had minor surgery on 14 February 1916 and was transferred to the 12th Field Company Engineers before joining them at Tel el Kebir in April. He left from Alexandria and disembarked at Marseilles on 11 May. During June to August he entered hospital a number of times unwell eventually being transferred to England with Lotar Pneumonia in November. After recovering he stayed in England on furlough and then was briefly attached to Depot at Pelham Downs before returning to France in March 1917. By this stage the unit was located in Abbeville supporting the troops well behind the front line. He stayed with his unit until February 1918 when he was admitted to hospital again, then re-joining his unit in May. He was on leave in Paris when the armistice was signed. He re-joined his unit and in February 1919 took leave to the UK and again found himself sick. He returned to Australia per H.T. Frankfurt disembarking 20 August 1919. 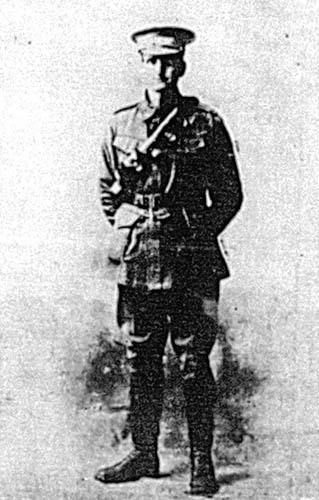 After enlisting on 5 January 1915, George was assigned to the 13th Light Horse Regiment at Broadmeadows training camp on 29 March 1915. Its regimental number quickly led to it becoming known as the “Devil’s Own” regiment. It left Australia on 28 May and disembarked in Egypt on 29 June 1915. George suffered a number of illness – gallstone colic, eye trouble, neurasthenia, flat feet and epilepsy. These kept him from shipping out with the unit to Gallipoli. During March 1916 he suffered hammer toes of both feet and subsequently on 11 April he was invalided back to Australia per ‘Runic’ from Suez for discharge. Died as a result of illness 31/8/1915 in training. The gathering of historical data and memorabilia is an ongoing process and every effort has been made to ensure the accuracy of the information. The information provided is based on the best available knowledge at the time of posting and may be updated from time to time. If you see errors in transcription, know of any honour boards / memorials not listed here or have a comment, please send us an email so that we can adjust our information accordingly. No reproduction may be made for publication without the permission of Cheryl Baulch. You may not publish or sell any portion of the data in printed, electronic or any other format without prior written consent.